Today I finished reading another book written by a serial author and social media influencer. The author is someone who is probably highly respected in the communication field and is also asked to speak on a variety of topics, including about how to become more human with your customers and putting a new perspective on social media. This author is Brian Solis and the book is called Engage – it’s a complete guide for brands and businesses to use to help enhance their presence on what Solis calls “the new web”. Having read his previous two books, now is gone and Putting the Public Back in Public Relations, that he co-authored, I picked up some interesting tidbits in each of them. So I wasn’t expecting a lousy book with Engage and I was definitely NOT disappointed. Engage is probably the one book I have in my collection right now that offers a different viewpoint on marketing and communication. It doesn’t harp on social media tools like Twitter or Facebook excessively like some that I’ve read before, but while it’s unavoidable, Solis does a pretty good job balancing the amount of praise and promotion of the various tools. Social Media 101 – understanding the tools and how today’s marketing becomes integrated marketing, plus defining what is social media. Social Media 202 – what are the risks associated with social media versus the good. Who wins out in the end? Social Media 203 – learning about multimedia and its application to social networks. Social Media 301 – discovering social media dashboards, virtual goods, and branded social networks. Social Media 302 – content curation, aggregation and lifestreaming. Social Media 303 – geolocation and those nifty widgets. Social Media 401 – time to learn about the philsophies and social sciences governing and enriching human behavior on the social web. Social Media 403 – creating a brand through social networks. MBA program – in the next two years, you’re going to focus more on the philosophies of social networking and how you can leverage it. Now I don’t want to give too much away surrounding the book, but I will say that aside from the refresher in college courses for probably nearly the first-half of the page, the rest of Engage centers more around your brand and the overall communication strategy and things you could consider. There’s more about Solis’ ideas surrounding how to get a brand involved in a conversation using social media through his new concept called the Social Compass that is thoroughly explained in the latter half of the book. What is shocking is that movie star and “first to a million Twitter followers” Ashton Kutcher (star of “That 70s show“) wrote the foreword for Solis’ book – very interesting to hear his words about social media & now after reading Engage, it’s becoming a bit more evident that Kutcher is living the words in Solis’ book. What I definitely liked about Engage is the pretty detailed case studies and examples that Solis features in the book, especially on social media analytics using a checklist created by web analytics genius KD Paine. Or when showing what a company’s social media guidelines should look like & cites Intel’s exact policy. Or it could be his detailed explanation on how someone could develop their very own social media plan. Overall, I found that there were quite a few gems of interest as I read through the book, including something about how to find people of influence in the new web. As cliche as the word “engage” has become with social media professionals, one of the things that Solis has done well is to literally put a clear understanding of what it is. In fact, I think he devotes a whole chapter where he references the human network. And yes, Cisco Systems is using that term and it become more appropo when you read more about the human network in Engage. In fact, compared to the social graph (coined by Facebook’s Mark Zuckerberg), the human network represents the connections that link us humans across multiple social networks. In Zuckerberg’s social graph, we’re looking at the relationships that we maintain within a social network (e.g. Facebook). Engage has become probably THE book to look at when you want to show your customers that you’re interested in them as human beings and how you’re connected, not how many networks you’re connected to them. Confused? Okay…put this way, Engage teaches you to care more about the human, not the social network. These are the qualifications and criteria needed to be established to help companies create and grow a lively, eternal and dynamic community of followers. Solis believes that companies wishing to “engage” with their customers should give them something to believe in. Make them feel special and wanted. What book by Brian Solis wouldn’t be complete without mentioning the Conversation Prism? Well obviously not Engage, but this time, Solis takes it one step further with the Social Marketing Compass. While we were used to having the landscape of social media drawn out for us in the Conversation Prism, the Social Marketing Compass will shed some new light on helping us as marketers figure out the path and direction we need to take to help draw a social media blueprint and will be inclusive of all the work and activity needing to take place. This social compass centers around the brand and helps to point that brand in what Solis calls as “physical and experiential direction to genuinely and effectively connect” with customers and influencers, where they interact and solicit advice. Again, overall I think I’m pleasantly happy with what Solis presented in Engage and I think that for any company wishing to learn more about social media marketing or how to really fine tune their marketing strategy should consider reading this book. 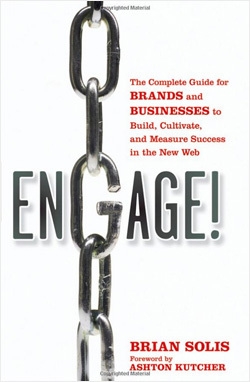 And while Solis’ last book was centered around public relations, Engage is something that should be widely read by all industries, including marketers, public relations and business professionals. You can read more reviews of the book here or purchase your copy of Engage by clicking here.